Gross Polowy Hosted a Bowling Night to Help Strike Out Cystic Fibrosis! Gross Polowy hosted an event to help Strike Out Cystic Fibrosis! Cystic fibrosis is a life-threatening, genetic disease that causes persistent lung infections and progressively limits the ability to breathe. In the United States about 30,000 people are living with cystic fibrosis (70,000 worldwide). We had a great turnout for this event that happened on August 19th. We were able to raise $1361 towards this cause. I’d like to thank the following organizations that donated to this event, such as the Buffalo Bisons, Cats Like Us, Rochester Americans, LA Fitness, Applebee’s, Anderson’s, Exit 2 Restaurant and SkyZone. Of course to Manor Lanes for hosting us! 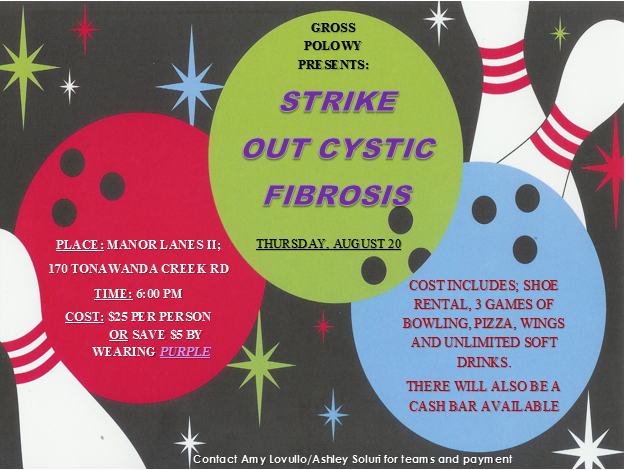 Gross Polowy is hosting an event to help Strike Out Cystic Fibrosis! Review the attached flyer for details. Cystic fibrosis is a life-threatening, genetic disease that causes persistent lung infections and progressively limits the ability to breathe. Contact Human Resources at 716-204-1798 for more information. Gross Polowy will be hosting a Blood Drive on Thursday, August 27th from 11am – 3pm. To schedule an appointment visit www.unytsblooddonor.org and enter Sponsor Code 000230 or call Unyts at 716-512-7940. Since beginning collections in June 2007, Unyts (Upstate New York Transplant Services) has become the primary supplier of blood products for ECMC, Kaleida Health, and all the hospitals in Niagara and Wyoming Counties. Our local hospitals need to maintain an adequate supply of blood for emergency situations and it is up to Unyts and the generosity of donors to help provide safe levels of blood inventory.